Daily grind gotcha down? Call on Dr. Harold Feelgood... A great gift for coffee lovers, and coffee addicts. 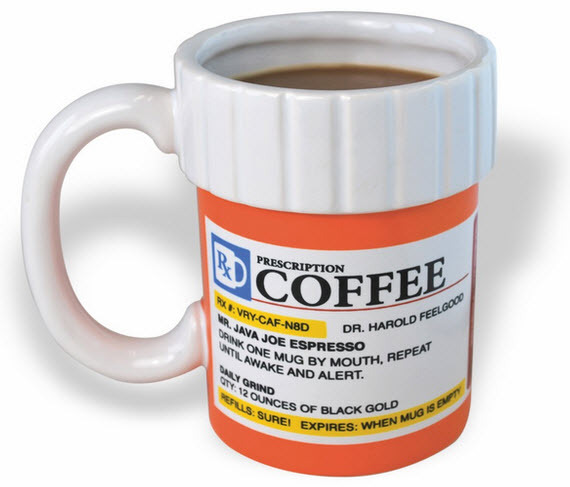 This hilarious ceramic coffee mug looks like a prescription medicine bottle, and the label is filled with hilarious puns about coffee. Lightweight ceramic mug topped with a clever coffee prescription, finished with an oversized handle. Disclaimer in red reads: May cause a Latte problems such as the jitters, sleeplessness, bad breath & irritability! Dr. Who Tardis Mug - Hot Liquid Makes TARDIS Disappear & Re-appear!